What is Zantac 75 Relief? Zantac 75 Relief and Zantac 75 are effective treatments for heartburn and indigestion that is associated with the consumption of food and drink. 1 Each tablet contains 75mg of ranitidine, an H2 blocker, which prevents the body from producing too much stomach acid, providing relief from heartburn, indigestion and acid reflux. 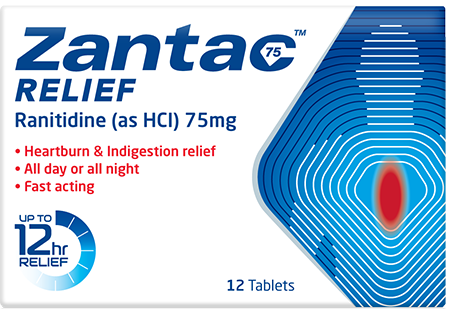 Zantac 75 can additionally prevent the symptoms of heartburn and indigestion. Each tablet is fast acting and keeps symptoms at bay for up to 12 hours. Zantac 75 Relief is suitable for adults and children 16 years or over. Swallow one tablet with water as soon as heartburn and indigestion symptoms begin. If symptoms persist for more than one hour a further tablet may be taken. Do not exceed more than two tablets in 24 hours. Zantac 75 Relief is available in pharmacies and supermarkets nationwide in packs of 6 and 12 tablets. For use as a preventative, one tablet of Zantac 75 can be taken half an hour to an hour before eating or drinking. Do not exceed more than four tablets every 24 hours or take for longer than two weeks at a time. Zantac 75 is available in pharmacies nationwide in packs of 24 and 48 tablets.